Climb Duration: One long day. Difficulty: Glacier travel. Crux involves a steep transition from ice or snow to Class 3+ rock. 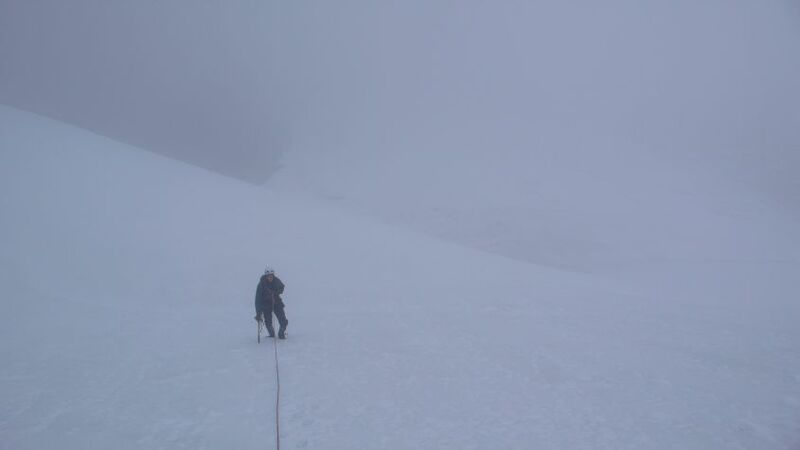 Bring rope, ice ax and crampons. In late season a couple of ice screws may be useful to protect the crux. Others in Party: Ben Schroter. 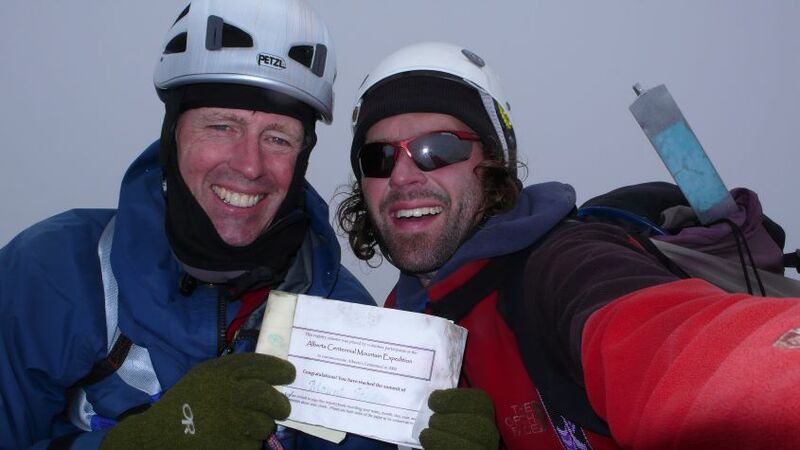 Climbed August 12, 2010. 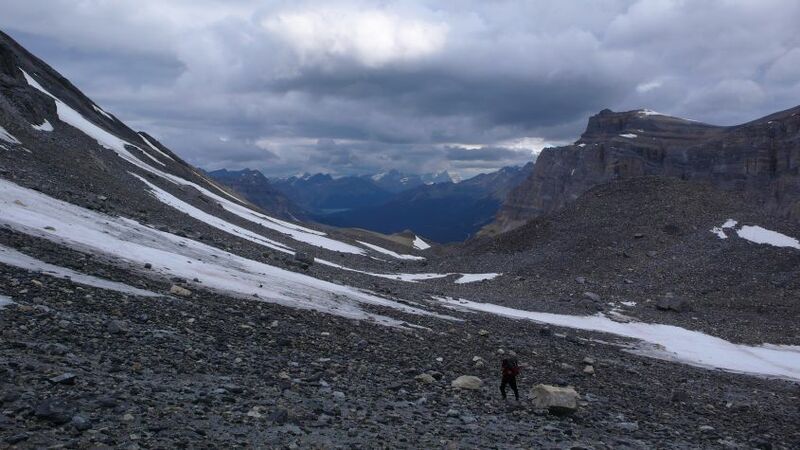 Additional resources: Selected Alpine Climbs in the Canadian Rockies by Sean Dougherty, pages 166-167. 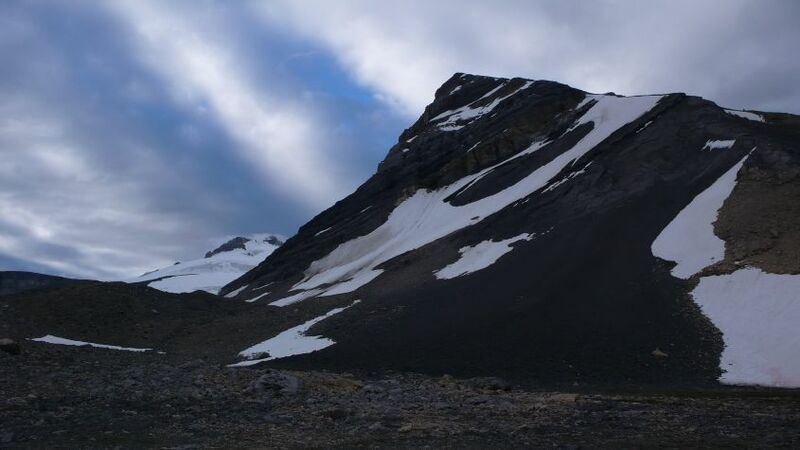 Driving Instructions: The route begins at Hector Creek (elevation about 6,000 feet) about 2 miles south of the Mosquito Creek Campground and about one half mile north of the Hector Lake overlook on the Icefields Parkway. There is a pullout with space for several cars on the west side of the road. Note: Just north of the creek in the forest across from the parking spot is a small blue Geodetic Survey sign. Route Description: Cross the Parkway and pick up a small trail on the right (south) side of the creek. Follow the trail up the valley. 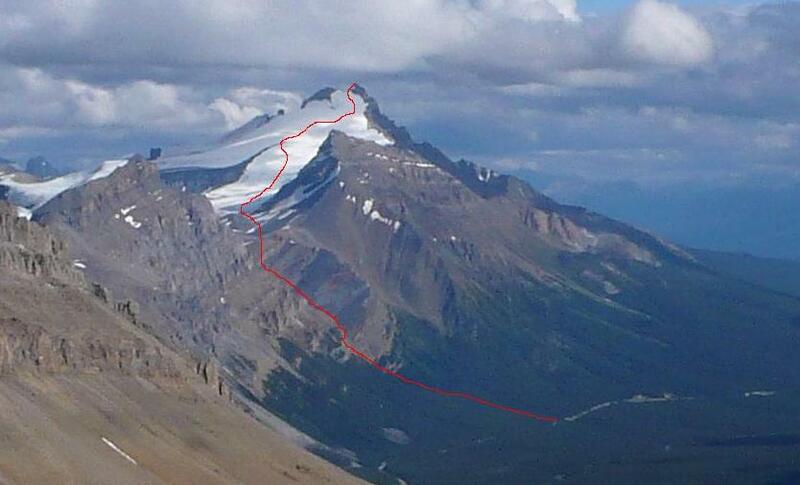 Ahead and to the left is Molar Peak. Ahead and to the right is Little Hector. When approaching the small headwall the trail crosses to the north side of Hector Creek climbing steeply through brush and small trees next to a waterfall cascade. Once above the steepest section the route re-crosses the creek and enters a broadening valley. Bow Peak is visible across the Parkway to the northwest. Once in the upper valley bear slightly to the right following its southern arm and ascend in an easterly direction to a saddle at its head at about 8000 feet. Turn right (south) here and proceed up the moraine reaching the tongue of the glacier at about 8,800 feet elevation. 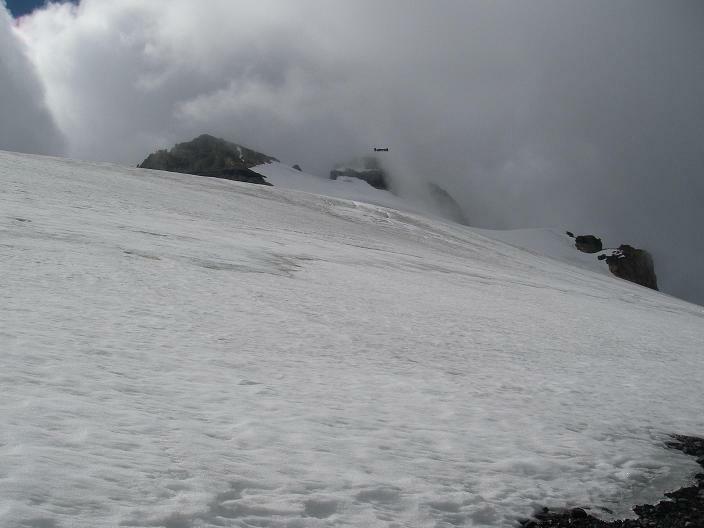 The summit of Mount Hector will come into view as you ascend around the eastern base of Little Hector. 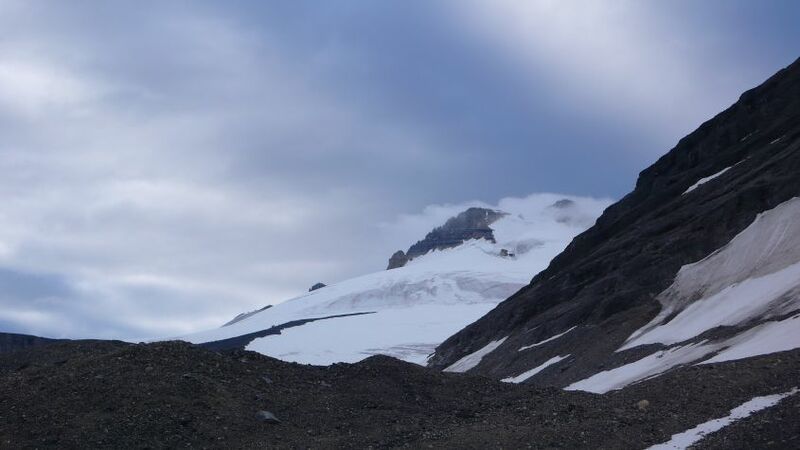 There is a large boulder near the glacier tongue that we used as a landmark where we roped up, put on our helmets, crampons and extra clothing. Follow the low-angle glacier south as it climbs east of Little Hector weaving through numerous sizable crevasses as you ascend. 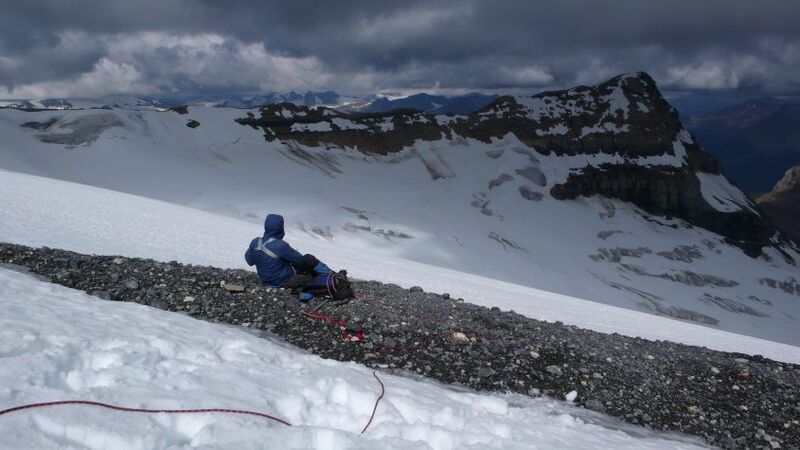 In late season we found a flat rocky area at 10,000 feet where we could safely relax and take a break. 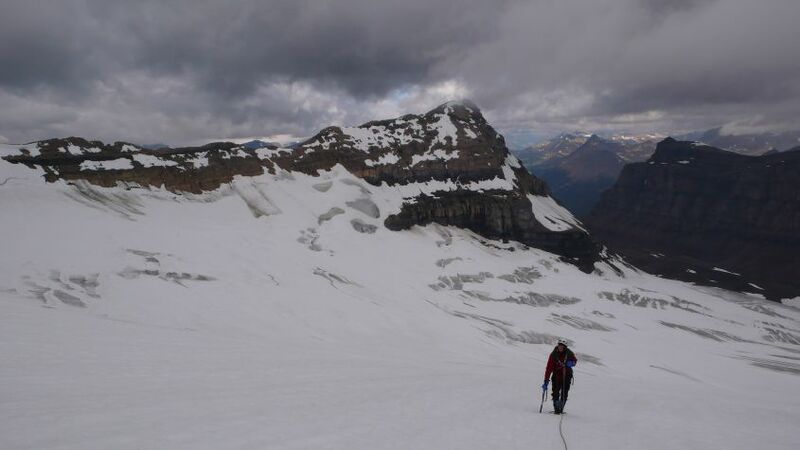 From here the upper portion of the route becomes progressively steeper and icier. 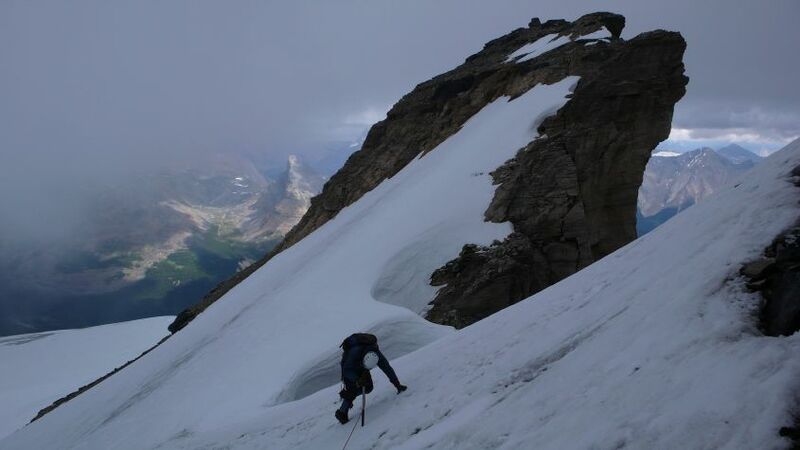 Earlier in the season snow cover may mean less icy conditions but this is counterbalanced by possibly more difficult scrambling on the summit rock. 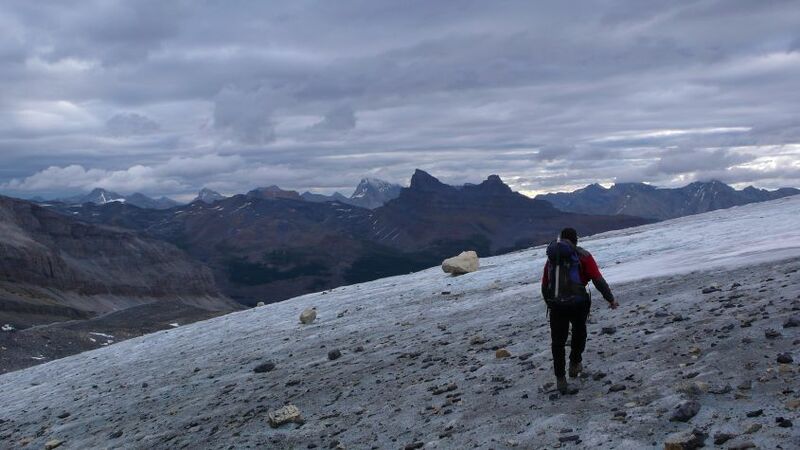 Follow the easiest line of ascent up the glacier to a small col just below the summit (about 11,000 feet). From the col make a climbing traverse right about 50 feet to rock. The ice here is quite hard and despite the moderate (40 degree?) angle an ice screw may be desired for added security. Accessing the summit rock can be tricky and represents the crux of the climb. We made use of a piton we found hammered into the rock as a belay and climbed up onto the rock a few feet to the right of this piton. The first few moves are the steepest. 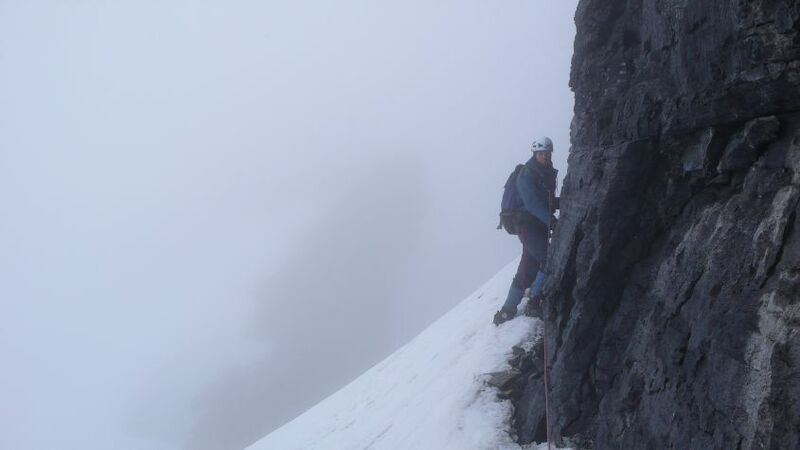 Once above this transition, it is a Class 2/3 scramble to reach the summit and register. 0793: Long distance overview of the North Glacier ascent route as seen from the summit of Cirque Peak. Click here to view the approximate route which is indicated with a red line. 0061: Bow Peak as seen from near the saddle high in the Hector Creek valley. 0068: Little Hector towers above in the right foreground with the summit of Mount Hector just visible behind. 0069: A closer view with the summit of Mount Hector partially obscured by clouds. 0071: View from the lower moraine. 0075: The large rock near the toe of the glacier where we roped up. 0098: View down the glacier of Little Hector from just below 10,000 feet. 0143: The upper end of a rocky peninsula at about 10,000 feet. Probably snow covered in early season. A good place for a break. 5705: View of the upper part of the glacier up the final slopes to the summit rock. 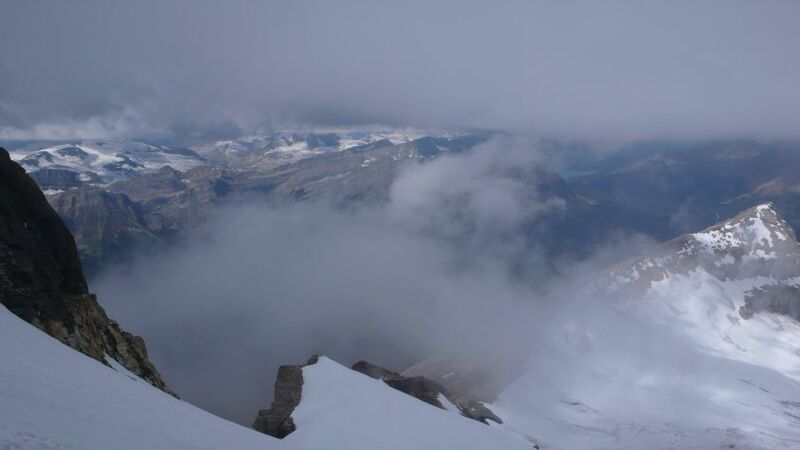 The summit is the western point partially obscured by clouds. 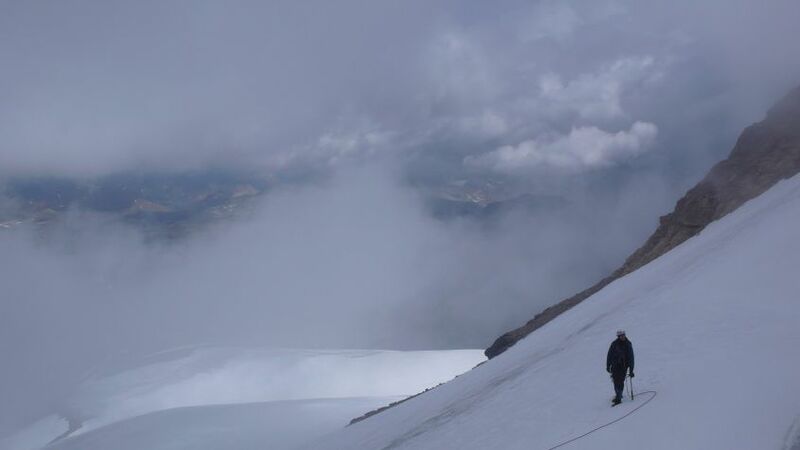 0154, 0159: Ascending the upper glacier. 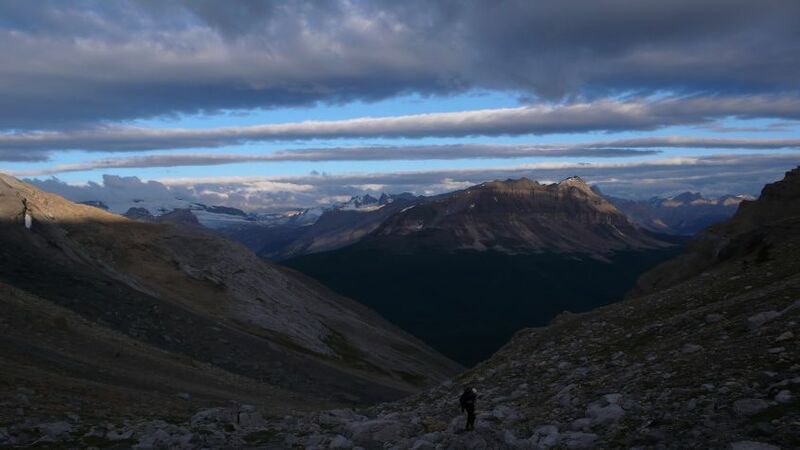 far right with the Icefields Parkway just visible beyond its upper left shoulder. 0165: Moderately steep ice just above the final col. In late season an ice screw or two could be useful for protection here. was taken from where we found the previously anchored piton. 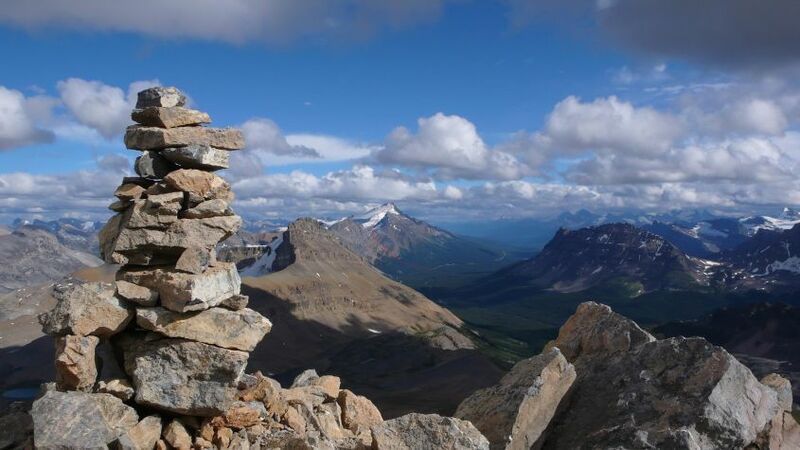 as seen from the summit of Cirque Peak.